The stricken vessel is being towed by LÉ Aisling. 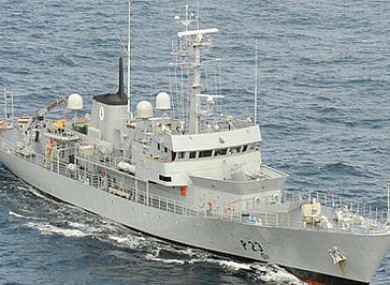 THE NAVAL SERVICES deployed a vessel to help a tanker off the coast of Clare yesterday after its engine failed. The LÉ Aisling reached the MV Hellespont Charger (MV) in the early hours of this morning following a call for assistance from the Coast Guard. According to the Defence Forces, the stricken vessel lost main engine propulsion about 100 nautical metres west of Loop Head. It was not put into any immediate danger and all 22 crew on board are safe. The MV is now being towed with the tug boat Thrax and the two vessels are expected to arrive in port before 6pm today. Weather conditions are described as rough to moderate with poor visibility. Due to the size of the vessel, it is only travelling at a maximum speed of three knots per hour. Its final destination is Auginish Ireland, according to the Marine Traffic website. RTÉ reports that it is carrying 15,000 tonnes of caustic soda for the plant in Foynes, Limerick. Email “Navy vessel helps tanker with 15k tonnes of caustic soda after engine failure”. Feedback on “Navy vessel helps tanker with 15k tonnes of caustic soda after engine failure”.